Frosting & Sprinkles Cakery is located in Ajax, serving the surrounding Durham Region (Pickering, Whitby, Oshawa) and the GTA. Whatever your dessert needs are - custom cakes, cupcakes, dessert tables, candy buffets, Frosting & Sprinkles Cakery can help! With a wide range of options we will work with you to help make your special occasion perfect! Want to tell someone you appreciate them in a fun and unique way? Say it with cupcakes! Happy Birthday, Happy Anniversary, I Miss You, Thank You, I'm Sorry - you can say it all with cupcakes or an edible bouquet! 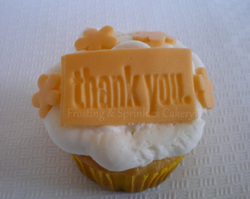 Try saying 'Thank You' with cupcakes!